After graduating from the Tokyo University of Foreign Studies with a degree in French, Hiromi studied at the University of British Columbia where she completed her Master’s. She then worked as a broadcast interpreter for BBC World Service in London for 4 years from 1994, until her return to Japan. Upon returning, she has been freelancing as a broadcast interpreter (NHK-BS, BBC, CNN, etc.) and also as a conference interpreter. 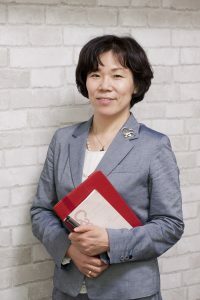 She is an Associate Professor of English Literature at Aichi Prefectural University since 2015. Her newest work, titled Addicted to SI, was published in 2016, with raving reviews. Addicted to SI is the title of my book that was published from Heibonsha in 2016. I chose the same title for this talk because I believe the title best represents everything that is good about interpreting. I will talk about my daily routines as a broadcast interpreter, with some hot recent episodes, and also my successes and failures as a conference interpreter. I will also discuss my preparation process and mindset. Every job, not matter how insurmountable it seems, is conquerable, but you have to be determined to take a first step and go through the grind. After a while you will acquire the necessary skills, but perfection will never be within your reach, and the pressure will always be there. But even with all the stress and agony, interpreters have one of the best jobs in the world – for we are given opportunities to learn through our work, and be part of something historic.